Finch and Reese may have a highly sophisticated network of top-notch surveillance on their side, but some people don’t need Finch’s machine to become a highly skilled fixer. 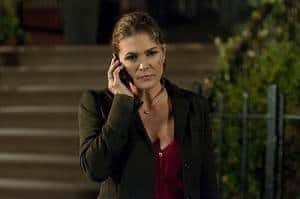 Enter this week’s POI, Zoe Morgan (Paige Turco) or, as I likely will refer to her in this review, lady!Reese. There were the usual red herrings in the first twenty minutes both in the reason for the machine picking this number and in the nature of the trouble the POI is in (She’s the victim! No, wait she’s the shooter! Nope she is a target!). 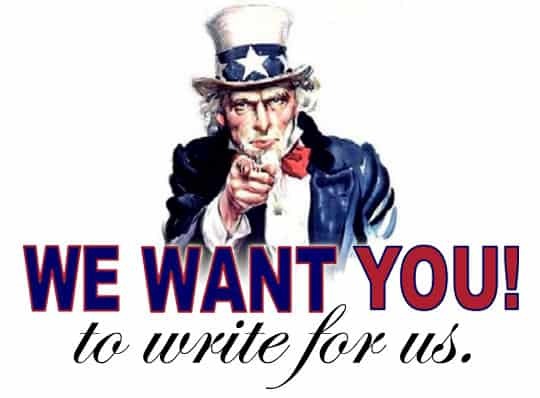 But the facts are these: Zoe was hired on by a man who stands to inherit the pharmaceutical company his father started unless his big secret is exposed thanks to a recording of a phone conversation that’s being used as blackmail material. What starts out as a simple case of a powerful man possibly not keeping it in his pants, soon turns into a conspiracy to cover up the lethal side effects of the company’s impending release of migraine wonder-drug, Sylocet. But that’s not all, it turns out the woman on the blackmail tape is none other than one Dana Miller. A woman who Finch’s machine called up before he started working alongside John Reese, and so he wasn’t capable of helping. Her death has haunted him ever since, but this could be Finch’s chance to avenge one of the ghosts from his machine all while we’re introduced to the kind of character that will likely be a recurring addition to the series. As the episode began, I was all for the addition of lady!Reese to the proceedings. It was nice to see John have a sort of mutual admiration scenario going on with a character that deserved it. She’s matched with him on every level, well we didn’t get to see her violently annihilate an assailant but still. Zoe has the skill, intellect, and charm that Reese brings to the game. However, when those two shared most of the episode together, it really brought to light a couple of the aspects of this series that need improvement, one of those being the dialog. If it’s not full of a little too much exposition than it’s stuffed with one-liners from the handbook of tough guy/bad guy/henchman one-liners. It’s fine in small doses, say before Reese is about to bring the pain on some of those smirky thug types, but when you had two of them running around spouting off quip after quip it got a little old. 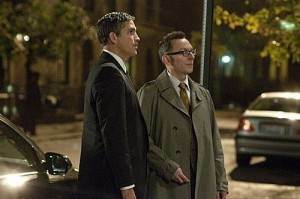 A bit of playful banter works much better between Finch and Reese as there’s the difference in personality type to lend a level of contrast to such an exchange�it’s when we have two very similar characters on screen at once that it becomes a bit much to take. Not all of the dialog was worth a slight eye-roll in this episode however, the scene with Finch and the head of the pharmaceutical company was pitch-perfect. Emerson showed off his innate skill at cutting down others without raising his voice even slightly as Finch calmly and venomously threatened the man who caused Dana Owen’s untimely demise. There was another Emerson highlight when Finch explained to Reese what the Dana Miller situation had meant to him and why it was so important they handle this endeavor right. Even Reese could tell just how deeply wounded Finch was by the missed opportunity to save this woman’s life. Another problem, for lack of a better word for it, would be the lack of tension. 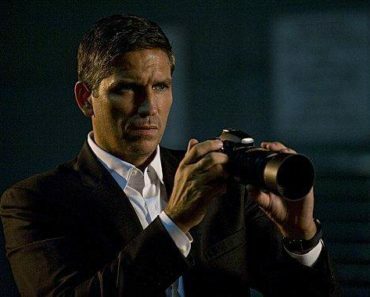 It’s always entertaining for Reese to be Reese and handle any situation with forceful precision, but it really leaves a sense of, ‘of course Reese is going to beat the bad guys’ that starts to affect the payoff of these scenes. 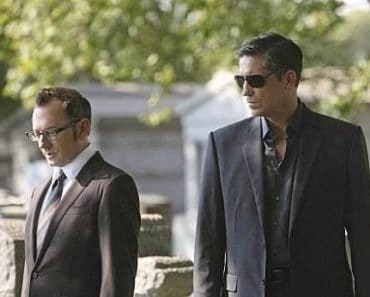 What Reese and Finch need is a proper nemesis, no vigilante team should make do without one, to ratchet up the dramatic conflict�the show could only benefit from such a figure and sadly Det. Carter just isn’t doing it for me in that department. This week over on Detective Carter’s end of things, a crime scene with connections to an old murder leads Det. Carter onto the trail of what was hinted at in an earlier episode. 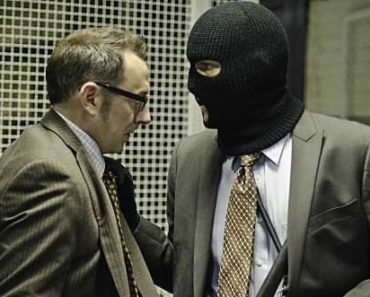 Back when Reese went undercover in the armed robbery ring of former soldiers, a very specific piece of evidence was taken from the storage unit they went to. A knife from the past murder of a mobster’s mistress wound up sunk into the rib cage of a man connected at that time to the adulterer in question. Carter receives temporary help from the cop Sully (Dan Hedaya) on the case at the time until he too winds up dead. There’s something bigger going on here and it’s going to lead Carter to wrongfully targeting Reese since she knew he was in the storage unit as it was robbed. 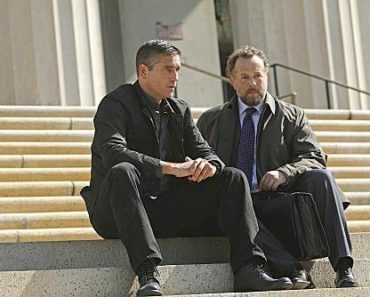 At least Fusco wasn’t around this week to be really painfully obvious at sneaking info to Reese somehow under Carter’s nose. I just don’t much care for this part of the show and I give it chance after chance weekly to turn it around. 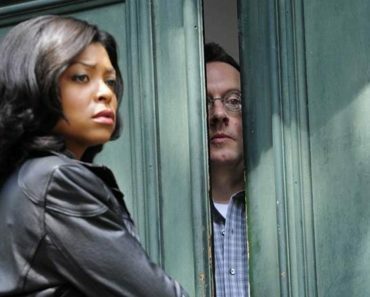 It’s such a shame, because Taraji P. Henson is such a fantastic actress and she hardly gets anything substantial to do. When she does, it’s usually in the thankless role of the by the book law enforcement agent out to put a stop to a dangerous vigilante. Hopefully they find a way to fix the character and her role in the show, as it stands the Carter scenes can’t compare to the rest of the show. 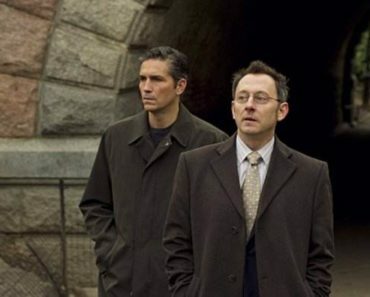 First seasons are a learning curve, Person of Interest is clearly trying to find that perfect balance, but it’s apparent that there are definitely aspects of the show that just don’t pull their weight. Luckily, this show has an abundance of charm and a recent full season pickup to show us what they can really do. It’s my hope that all of these recurring threads that have been teased in both the present and in flashbacks are going to pick up and move the story forward into some satisfying surprises and outcomes for the characters and audience to experience. I’m also really looking forward to Mr. Finch going through a virtual National Audubon Society Guidebook of bird-themed aliases (it was a partridge tonight) throughout the rest of the year.